This hand-made currency album comes in a black classic lighthouse design. It holds 20 currency notes or currency sleeves in crystal-clear pockets. 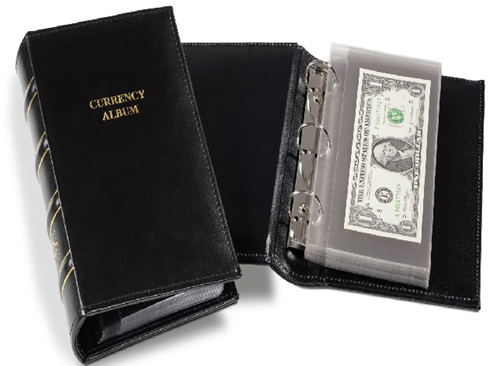 The, 7 1/2 x 3 1/4, Lighthouse currency album has a 3-ring binder system that allows easy removal and addition of pockets; extra pockets are sold separate in packs of 10's. This Lighthouse currency album holds and displays all modern U.S. dollar notes with or without sleeves. Start your currency collection now!